This page is currently being rewritten as part of the Morrowind Overhaul Project. Plitinius Mero, an Imperial savant, is an author in the employment of Barenziah. This may seem strange, since Plitinius wrote The Real Barenziah, a book that uncovers a seemingly darker side of Barenziah's past. However, it appears that they became friends after the book was published, and that Plitinius was in fact a scribe for Barenziah. Plitinius is very knowledgeable about the happenings of the Royal Court, and this does prove helpful in the Blade of Nerevar quest. "Plitinius Mero" is actually an alias; after writing The Real Barenziah, he had to assume a false name to escape persecution by the Imperial family. He wears an expensive shirt with matching pants and shoes, and a dire shardbolt ring. He wields a silver dagger, and he carries four exclusive restore health potions and a large amount of gold. Aside from his natural charm and ability to absorb fatigue from others, he knows no spells. Queen Barenziah: Speak with the Queen for further matters of state. The Blade of Nerevar: Gather the three broken pieces of this legendary blade to reforge it. "Good to see you again, friend! I was just doing a little writing." "Good for the Empire, good for all, eh, citizen?" "Strange creatures in the city? Have you alerted the Royal Guard?" "These ashstorms do not bode well. What can the goddess be thinking?" "You've returned from the Clockwork City! Perhaps I should write about you sometime...."
"Hello! What can I do for you?" Almalexia: "Almalexia is a member of the Tribunal. She was the wife of Nerevar, and one of his most trusted advisors. She resides here in Mournhold, and is much loved by the people." "Yes, I've written a few things here and there. Some histories, biographies. I really don't feel comfortable speaking with you about this. I hardly know you!" "Hmmm...yes, well. I suppose I have written one thing you might have read. You see, there was a time I worked as a scribe for a beautiful young queen. I was young and ambitious, perhaps a bit too much of either for my own good. After great deal of research, I was able to publish a biography." "Ahh...the Lady Barenziah. A fine, fine woman. It has been my pleasure to have known her as long as I have." "I've been told that the great lady has been killed. This is a loss for all of Morrowind. I can't express my sadness at this occurrence." "You should not even speak of that cursed object! I'm sorry, friend %PCName...I did not mean to snap at you. I have heard many tales of that ring, and the evil Barilzar who created it. It was to be a means of teleportation for the wizard, but it was much worse than that. That ring was said to open gates to hellish planes, releasing creatures best left in nightmare. I've heard the ring was stripped of its power, and that only a god could use it now and not be destroyed. The thought chills my bones." "You've found the ring and returned it to the goddess? Foolish, foolish, foolish. I hope your faith in her is well-placed, %PCName. In the wrong hands, I shudder to guess what evils could be unleashed on the city." biography: "Why, "The Real Barenziah," of course! I felt it my duty to give to history a true and honest account of this remarkable woman. The story I presented, while true, was perceived as scandalous. My exuberance for the tale was left unchecked by wisdom, and I fear I caused some damage to the woman, not to mention the Imperial family." caused some damage: "As I've said, the tale was a true one. However, the details within should probably not have been divulged as they were. There were details that were felt to be embarrassing to the Septim line, though it was not my intent for them to be so. The work was ordered banned, and I was to be executed. Were it not for the grace of the lady herself, I would long be in my grave." Dark Brotherhood: "The Dark Brotherhood have a long and interesting history, though a great deal of it still lies shrouded in mystery. What is certain is that they are deadly and remorseless. Steer clear of them at all costs." "My research tells me that Hler has been with the Lady Almalexia for many years now, serving in an official capacity as her Steward. What these duties entail is not known to me, but there are rumors that he carries out some of the more...unpleasant chores for the goddess." "I have been told that Hler was found murdered. This is surprising news. The goddess must be very angry." "Gavas Drin became the Lord Archcanon over 10 years ago, when the former Archcanon died of old age. Drin has spent his life in servitude to the Lady Almalexia, and he has been rewarded with great power." "I have heard that the Lord Archcanon has been murdered. I can't imagine who would do such a thing. Those at the Temple must be very concerned." grace of the lady: "If you've read the work, you'll know that Queen Barenziah is many things--but she is not shy, and she is not ashamed of how her life was led. She knew my work to be true, and I believe she felt a sense of amusement, if not satisfaction, at the tale's telling. She protected me from the Imperial family, and spread the word of my demise at her guards' hands. Since then, I have traveled with her under this name, acting as her scribe, her advisor, and dare I say...her friend. I could ask for no greater honor." greater honor: "The only thing I hope for is to one day be able to publish further volumes of the work, to chronicle the Lady's life after her marriage to King Eadwyre. Perhaps one day I will be able to, but I am old, and my time grows short. Oh, that I could write fiction as great as the plot the Lady Barenziah has lived!" "Helseth is the son of Barenziah, former Queen of Morrowind, who herself was the niece of King Athyn Llethan. It is certain that his bloodline is strong. He is a young king, though, and perhaps a bit rash. He does not yet possess his mother's wisdom or his father's courage." "The young king has been murdered! I cannot imagine who would do such a thing." 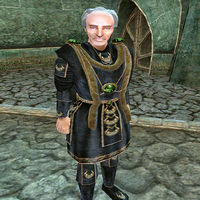 High Ordinators: "They are much like the Ordinators you might see in Vivec, but they are even more dangerous. Only the best of this sacred order are chosen to serve in Mournhold. To wear their garb is considered a great honor. Any others caught in it are summarily executed." "Best fighter I've ever seen, and I've seen the best in Tamriel. Hell with a sword, deadly with his bare hands. Shrugs off most attacks like they were beestings. A good fellow, though. Doesn't speak, but you can tell by looking in his eyes. Can drink most of my men under the table, too! Take care with him, %PCName. If you haven't already, you might speak with the Lady Barenziah about him. She's spent some time in his company." "I heard you defeated him! Amazing!" "An attempt to reforge the blade of Nerevar. Interesting.... I wish I knew where to tell you to look, but my knowledge of the blade is somewhat limited. Perhaps you'd do better speaking with Torasa Aram, the curator at the Museum. Her knowledge is extensive when it comes to unique items. Of course, it is always wise to consult the Lady Barenziah. One never knows what the Lady has heard." "You've recreated the Blade of Nerevar? The Trueflame forged once again! Amazing. I shall have to take note of this for my new volume." "You're not speaking of the type of plot I'm used to, are you? Heleseth [sic] has told you of a plot against his throne? Odd. He's well protected, you know. I would suggest meeting his informant and seeing what he has to say. If you have any further questions, please come and speak with me. If the Queen Mother has sent you to me, she must feel you worthy. Good luck to you." "A plot against Barenziah? That's ridiculous! I can't think of anyone who would want to harm her. Take care with this friend. King Helseth is a wary one, and delights in testing the loyalty of his new friends. I do not believe the King would hesitate to put his own mother in danger in order to do so." "It seems you've taken care of that situation. I find the whole thing very odd, my friend. You should take care." protect Barenziah: "Protect her? Ha! My sympathies lie with the assassins, friend. The Lady is far from helpless, as many have come to find out the hard way. Still, it is odd that someone would even attempt it. Why kill her? Her son lives only down the hall, and he bears the burden of rule. There is no understanding the machinations of madmen or politicians." "Oh! The Lady Barenziah! A wonderful person. She's quite an interesting story, don't you think?" "You've spoken with her, and she said to speak with me? She's a wonderful person, and has become a great friend of mine over the years." Royal Guard: "They're an elite group, picked by King Helseth for their bravery and complete devotion to him. Some have been with him since his time in Wayrest. Their leader, Tienius Delitian, is a fine soldier, and a good man." Shrine of the Dead: "I've read about the shrine. At one point, it was rumored to hold great power. It was used by the Dunmer to harness the power of their ancestors. Some said it could have been used to summon legions of the undead, but that's never been proven to be true. Either way, it could have been a very powerful tool, but it was buried at the end of the First Era, along with the rest of Mournhold." Sotha Sil: "Sotha Sil is one of the three God-Kings of Morrowind. While Vivec and Almalexia have traditionally been fairly visible to their followers, Sotha Sil has been more reclusive. He is known as a great mage and scholar, and is said to live in a Clockwork City of his making." Talen Vandas: "Yes, I heard the poor man was killed while hunting. Odd, that. He was a powerful warrior, and should have been more careful. Rumor has it that Athyn Llethan was grooming him for the throne. He was Llethan's nephew. I suppose that is a moot point now, though." "Tienius has been with Helseth since he was a child in the Emperor's court. He's a career soldier, and has risen through the ranks quickly. Helseth chose him to lead the Royal Guard not only because he is a fine warrior--Delitian is also a savvy politician, and he is an excellent judge of character." "I heard Captain Delitian had been murdered. He was a good man. I fear the effect it will have on the king." This page was last modified on 15 November 2018, at 19:04.